This post is inspired by Rachelle's how to store lettuce and salad advice. It was a godsend to me! Seriously, one of the few items I really had no clue how to store and not end with a floppy piece of very unappetizing green trash. I could compost them, sure, but why? Why waste it? Anyway. The idea by Rachelle is simply to separate all leaves put them in a container you can close, fill that container with cold water, close and put into a fridge. So as much I couldn't say no to the pretty illustration, this isn't going to be a post about preserves. 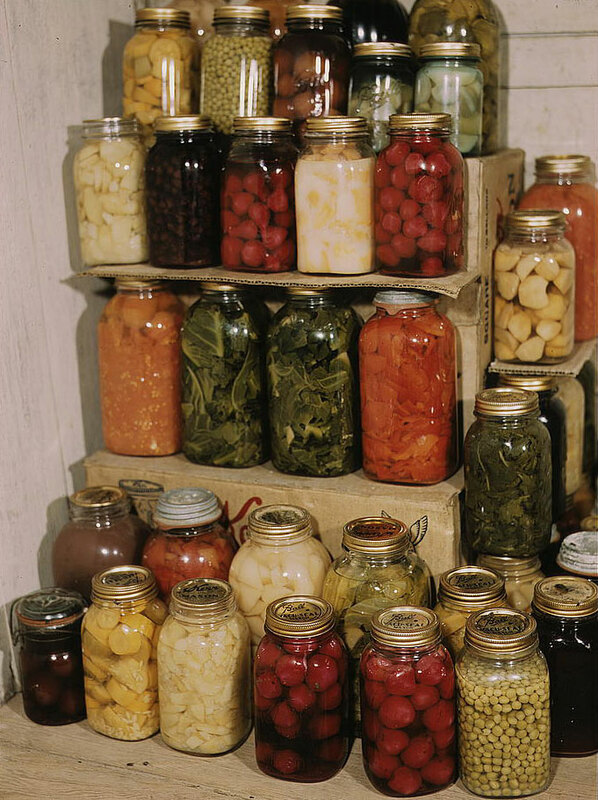 But mostly about fresh food storage. Because, you know, there are things I have a lot of experience storing, mostly due to the fact that I buy lots of them in a strange bout of: "ooh home-made pizza, it can't be that hard!". And then, of course, it turns out that it either is hard as hell, or takes more time than a preparation for an expedition to Mars, or I am simply bored with the idea and end up with 5 kilos of endangered flour. For starters, you can't store washed or damaged potatoes for long. I've met a lot of people who had no idea that potatoes should be stored in TOTAL darkness. Why? Because if not they become poisonous. Yes, I'm not joking, go have a read about solanine if you wish to know more. And with air access, so that they don't rot. Several organic box delivery companies pack them in paper bags which seem to be a brilliant idea, if only we remember about last necessary condition for them to be stored: in cold. Not freezer mind you, unless you're aiming at the softness of an overused Ikea mattress, Ideal temperatures to store them are between 7-10°C. Storing them the same way as lettuce leaves mentioned above isn't working because then they will drink that water and become tasteless and well... watery. But they have to have high humidity (around 90%). So this all looks like a good old cellar really. And if you have means to secure these conditions, you can store potatoes safely even for several months. But what if you don't have a cold place like that? If you have a garden you can build a storage for them: Dig a yard deep and wide trench. Length depends on the amount of potatoes you're storing. So you see already this is not a method for small amounts really. Cover bottom with dry twigs, straw or leaves. Lay vegetables on it. This method also works for storing carrots, parsnips, parsley roots and beetroot. You can store them together too. Then you cover it again with twigs/straw/leaves and add soil on top to form a mound. Should temperature drop below 5°C, you need to add another 15cm of dry stuff and 15cm of soil. And if you have neither do as I do: Try to make them cool, keep in the dark and eat fast! OMG. Now this is a real nightmare. Mostly because the stuff we buy in various shops comes on beautiful, good smelling vines. Take them off the vines immediately! Vines will 1. drain juice from them. 2. For some unknown to me reason attract fungi. And never store them in airtight containers (bags, jars, you name it), they will simply ferment in it. Did I say potatoes like low temperatures? Actually, all veggies do. Some fruit actually like to be stored in very low temperatures. That how you get winter apples in the spring. So yes, tomatoes like it cool too. But now the real fun starts. If you've bought usual tomatoes from a supermarket, they are most likely not ripe. They may look orangey-red, but rarely are untreated or sun-ripened. And you should never store unripe tomatoes in a fridge! This actually has a scientific explanation. Some of the chemical compounds which give tomatoes their divine taste get damaged in very low temperatures. So what was I on about low temperatures? Because it's best to store them above 10°C but lower than 20°C. And out of the sun in a well-aired place. But then ripe tomatoes actually get quite well if stored between 7-10°C. Or even in a fridge, because it will not damage their taste and stop the ripening process. Don't forget tomatoes are actually fruits, so they will get ripe naturally until they rot. Low temperatures slow this process. Soak tomatoes in 51°C water for 5 minutes prior to refrigerating and they will keep a lot of their aroma for longer. (based on experiments by an American scientist Jinhe Bai). Depends on what you have. But most of those can be frozen. I usually freeze bread in slices, because then it is enough to take them out of the freezer for 20 minutes and they're ready to eat, loaves would need to be treated in oven or microwave here, or potentially wait till your next birthday to defrost naturally, so the choice is simple. You can freeze bread for up to 3 months. For normal storing in room temperature I always suggest linen bags. That way certain types of bread can stay fresh for 10 days. Wooden bread bin is a good choice too. Why? Bread and rolls need to "breathe" to stay fresh, but they can get too much air, or they'll dry out. Also, linen and wood are natural, and they will keep mould at bay. Of course some can be frozen. There is one important thing to it, though: Portion you meats and fish before freezing and always label and date it! Never wash it prior to freezing, water helps certain bacteria grow. Yes even in a freezer. You can lightly sprinkle it with lemon juice, that will stop these bacteria. Make sure your freezer is working well, there are no major temperature fluctuations and temperature in it is around -18°C, they might spoil your meat, and that's very dangerous. How long can you store what? poultry only up to 3 months. General rule of the thumb is, that the fatter the meat is the shorter can it be stored. Fats oxidise and spoil faster. Always store in a fridge. Because you serve them in room temperature, remember to take them out an hour before serving (blue cheese needs less). Wrap in waxed paper or parchment and put in a box. Paper will let the cheese aired enough to keep it "alive" and the airtight container will create microclimate not letting the cheese dry out. Blue cheese will actually be ok wrapped in a foil. Different spices have different needs, but you will not get wrong if you ensure all are stored in dark glass jars or wooden closed containers, and in a cool and dark place. Dark, dry location. Ideally in airtight containers. Large quantities of flour can be stored in gunny sacks. This, however, needs low temperature up to 15°C, very well aired location, and darkness again. Also, it's best to dry out and sieve flour before storing. It's good to put a sack on a wooden box or pallet, to make sure it is well ventilated. Put them in a fridge into those little compartments nothing else fits in unless you're refrigerating ping-pong balls. Don't wash them before putting into a fridge, that may attract bacteria, wash prior to using. Never store them in full sun, high temperature or high humidity. But that's not the issue with eggs. The real question is: HOW LONG? Raw eggs (in the shell of course) can be kept safely in refrigerator 3 to 5 weeks. The exact timing depends on the freshness of them. Also, if you crack the egg and white has two well-defined layers (see image) that means the egg is fresh. Eggs have an air cell at the flat end. Store them flat end up, and they will stay fresh longer! Thank you so much! So glad you've found something useful in my post. It's very nice of you to stop by.